North Long Beach’s Lindbergh Science, Technology, Engineering and Mathematics Academy captured its third consecutive RoboBowl title on April 25 at McBride High School, where students from 14 local middle schools learned about science, math, engineering and technology while showing off their robotics projects. Lindbergh won first and second place, while Tincher Academy placed third. Other participating schools included Bancroft, Hamilton, Hill, Henry, Hughes, Jefferson, Lindsey, Marshall, Powell, Robinson, Stanford and Washington. Lindbergh Middle School became the Lindbergh STEM Academy after the Long Beach Unified School District Board of Education approved the new program in February of 2014. The school serves as a pathway for students interested in careers in the sciences. At the RoboBowl, each school’s robotics club participates in the competition, which gives students a chance to test their robot designs before attending official VEX Robotics events in the fall. 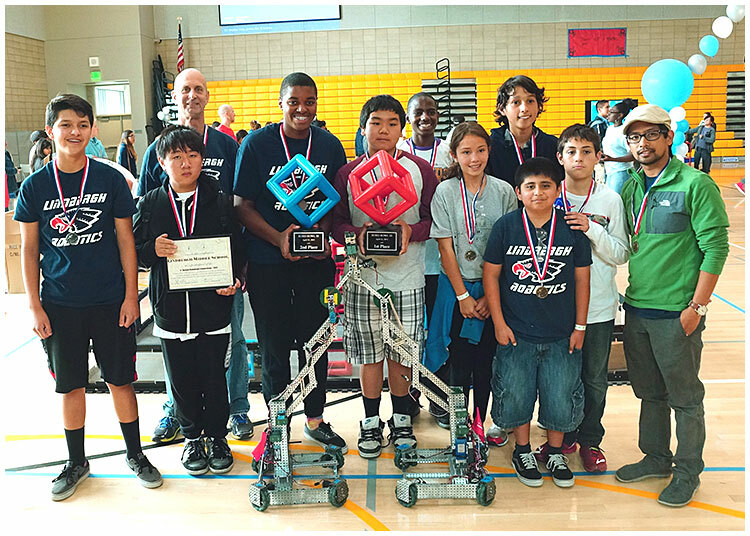 Since the RoboBowl’s inception the event has been a partnership with Leadership Long Beach with the aim of advancing STEM education throughout the school district. ROBOBOWL CHAMPS – Lindbergh STEM Academy's first and second place winning teams celebrate victory at the annual RoboBowl robotics contest held at McBride High School.